Encore: want to go where Packers fans are? I travel quite a bit, and during football season I often find myself trying to find where the nearest Packer bar and game will be seen. Usually I can find this out on the web somewhere, but a recent article on deadspin highlighted where the highest concentrations of fans are located, based on their "likes" on Facebook. I'll preface this by saying I don't believe a like should imply fandom, since some people are supportive because a team is just in their town. But that being said, the map is pretty interested - look at where all those Packer fans are located in Idaho and Alaska! 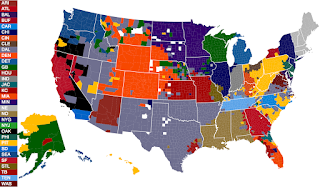 Well, Becky and Jason live in AK...and they like the Packers...so I believe this map completely! I thought it was interesting - definitely pockets all over the place!